Vacuum tube amplifier has two styles. One is an old style. Another is a modernistic style. In the old style, the main parts were put on a chassis and covered by a bonnet. Usually they had a monotone color. This is the traditional style. In the modern style, real wood for the front panel or a curved form might be used. Today, there are many novel ideas. The tube heaters are lighted when the power is turned on, and amplifiers make a nostalgic atmosphere. I get the feeling of a time trip to many years ago. How is the sound? 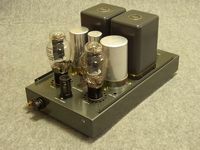 The vacuum tube amplifier has a warm and natural sound. Sometimes it has a little character. For example, the strings sound glossy and the brass sounds brilliant. These are some of a vacuum tube amplifier's charms. Since there is also a detail report of a design for a 300b amp, please have a look.